Welcome to the official website of the Eta Kappa Nu Lambda Chapter at the University of Pennsylvania. 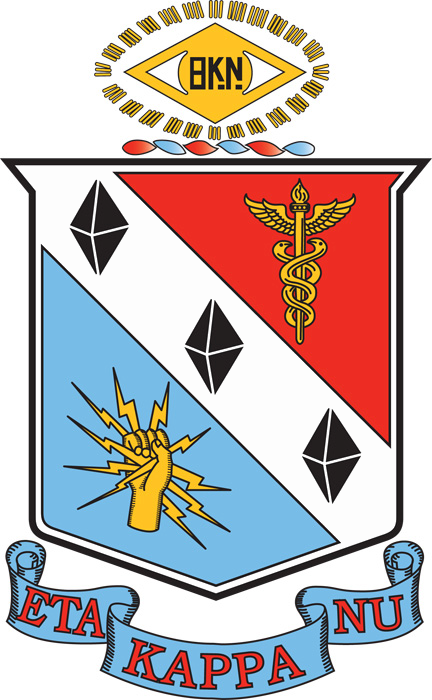 Eta Kappa Nu is the premier Electrical and Computer Engineering honor society in the nation (est. 1904). 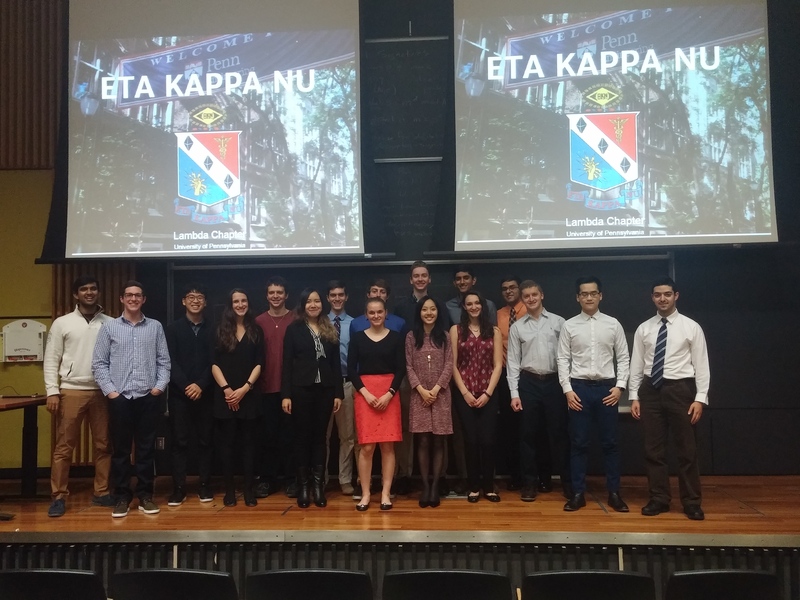 With over 200 student chapters globally comprised of over 200,000 members, Eta Kappa Nu is one of the most respected organizations in engineering. Eta Kappa Nu is dedicated to encouraging and recognizing excellence in the electrical and computer engineering field. Members consist of students, alumni, and other professionals who have demonstrated exceptional academic and professional accomplishments, along with superior character and attitude. 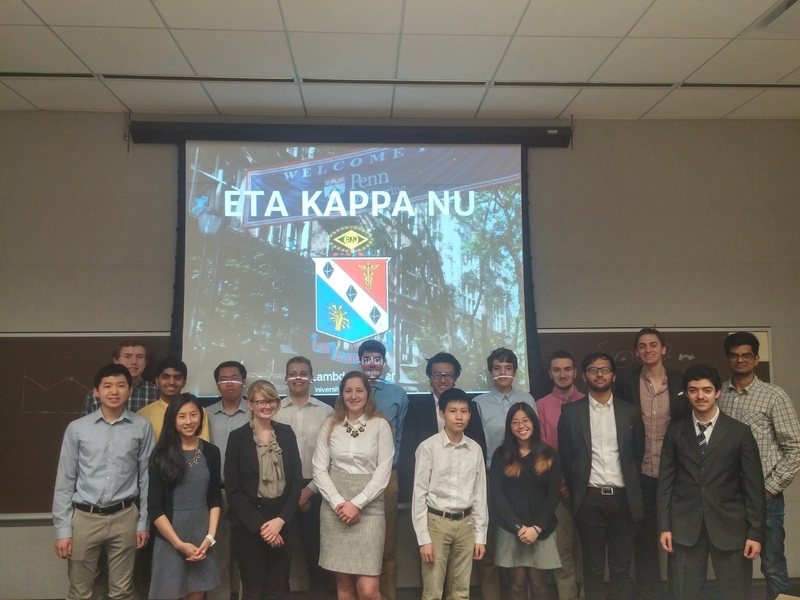 Although established over 100 years ago, Eta Kappa Nu continues to operate on its founding principles of recognizing excellence in the electrical and computer engineering field, with regards to academics and personal character. Moreover, the elements which its members devote their studies to are deeply woven into the society's brand and tradition. The goal of the Eta Kappa Nu Lambda Chapter projects are to provide useful and interesting opportunities to the student community at the University of Pennsylvania. These projects provide informative and engaging challenges to students, and academic assistance outside of the classroom. Non-HKN members are welcome to participate. Eta Kappa Nu's social events are aimed at bringing together the student and professional engineering community. Through gatherings of diverse individuals across numerous fields and backgrounds, priceless relationships are formed, giving young individuals valuable insight on career building and professional development. Congratulations to the 2018 Eta Kappa Nu Inductees! On March 19th, 2018, 76 new members were inducted into the Eta Kappa Nu honor society. These students represent three class years (2019, 2020, and 2021), and a variety of majors and minors. They all pose the character and attitude that defines the organization, and share a common goal of enriching the ESE/CIS/CMPE community. Congratulations to the 2017 Eta Kappa Nu Inductees! On February 2, 2017, 27 new members were inducted into the Eta Kappa Nu honor society. These students represent three class years (2018, 2019, and 2020), and a variety of majors and minors. However, they all pose the character and attitude that defines the organization, and share a common goal of enriching the ESE/CIS/CMPE community. HKN Board has been working on a Piazza for the ESE community to crowd source information about classes, professors, and other general advice. You can enroll by clicking this link. Make sure the term selected is "other" and search for "ESE@Penn"
Congratulations to the 2016 Eta Kappa Nu Inductees! On April 7, 2016, 39 new members were inducted into the Eta Kappa Nu honor society. These students represent four class years (2016, 2017, 2018, and 2019), and a variety of majors and minors. However, they all pose the character and attitude that defines the organization, and share a common goal of enriching the ESE/CIS/CMPE community. 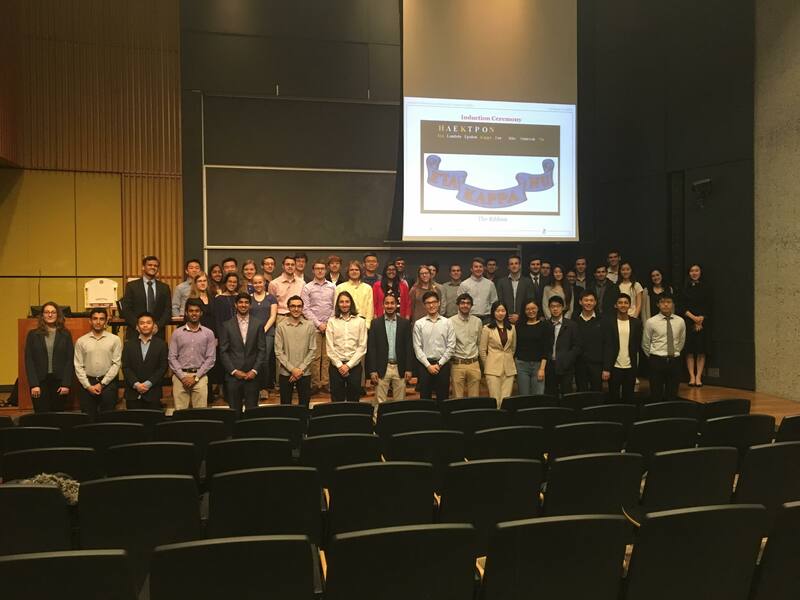 The 2016 Senior Design Freshman Mentoring program was made up of three interesting and innovative senior design projects: A drone designed to assist in disaster relief, a system to make crosswalks safer, and an investment tool that looks at financial and human capitol risk. Four freshman eagerly took part in the development of these projects, and learned a lot throughout the process. The 2015 Senior Design Freshman Mentoring program was made up of four interesting and innovative senior design projects: A mental health application, an application based robot, an investment aid, and a pitching training sleve. Eight freshman eagerly took part in the development of these projects, and learned a lot throughout the process. Congratulations to the 2015 Eta Kappa Nu Inductees! On January 29, 2015, 24 new members were inducted into the Eta Kappa Nu honor society. These students represent three class years (2015, 2016, and 2017), and a variety of majors and minors. However, they all poses the character and attitude that defines the organization, and share a common goal of enriching the ESE/CIS/CMPE community.